PORTLAND, OR, 6/5/2018 — Image Comics/Skybound is pleased to announce a special WALKING DEAD 15TH ANNIVERSARY BOX SET stuffed with over 3,300 pages of Robert Kirkman and Charlie Adlard’s walkers, Survivors, Saviors and a barbwire bat named Lucille—just in time for readers to enjoy in the days leading up to this year’s THE WALKING DEAD DAY on Saturday, October 13th. 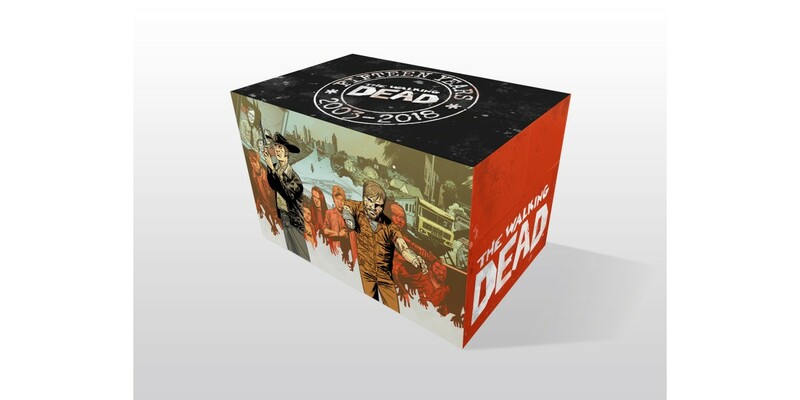 This deluxe boxset includes THE WALKING DEAD Compendiums 1, 2 and 3—each with exclusive, new covers—collecting the first 144 issues of the New York Times bestselling survival horror series from Kirkman and Charlie Adlard. It also includes an exclusive, expanded edition of the HERE’S NEGAN trade paperback, which now features the previously uncollected origins of Michonne, Tyrese, the Governor, and Morgan. This box promises to be the most complete collection of THE WALKING DEAD ever assembled and is a cannot-miss experience for the ultimate fan. THE WALKING DEAD COMPENDIUM 15TH ANNIVERSARY BOX SET will be available on Wednesday, October 3rd and in bookstores on Tuesday, October 9th. The final order cutoff deadline for retailers is Monday, June 11th.